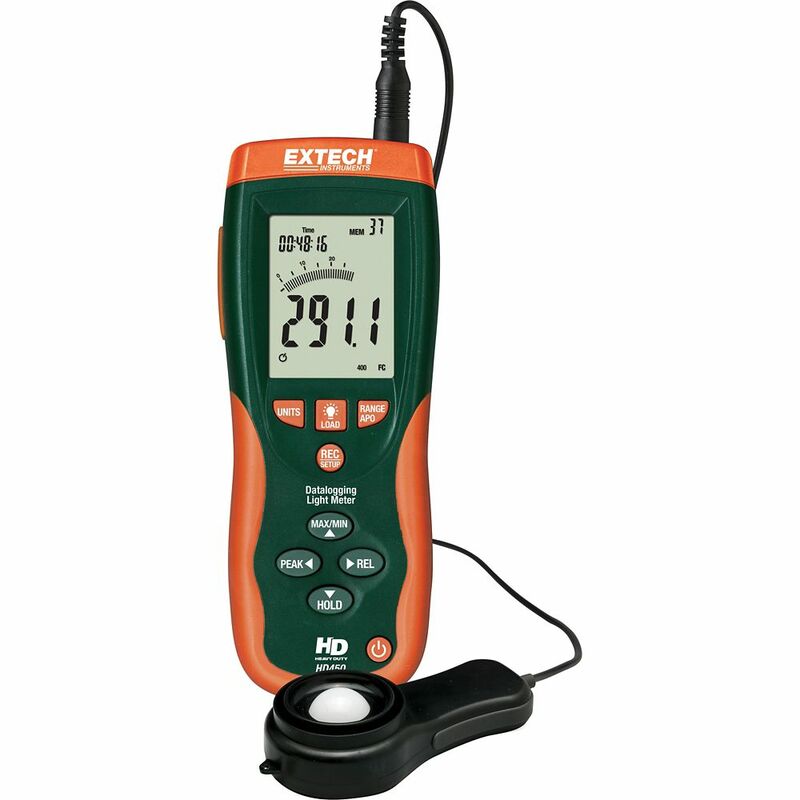 The HD450 is a Light Meter which measures from 0 to 40,000Fc and 0 to 400kLux with 0.01Fc/0.1Lux resolution. Meter features: 5% accuracy, Peak mode (10s), Relative mode, Min/Max, Data Hold, backlit LCD display with 40-segment bar graph, and a rugged double moulded housing. In addition, the datalogger function can automatically store up to 16,000 readings or manually store/recall up to 99 readings. Comes complete with light sensor with a 3ft (1m) cable and protective cover, software with USB cable, hard carrying case and 9V battery. The MA150 is a Mini clamp-on meter that offers the convenience of a built-in non-contact AC voltage detector and bright white LED flashlight. Measures AC current up to 200 Amp with 0.1 Amp resolution. Also measures AC/DC Voltage and Resistance. The 0.7 in. jaw fits around conductors up to 300MCM. Compact size allows getting into tight spaces. Auto power off, data hold, and low battery indicator. Includes two AAA batteries and case. The 407736 is a Sound Level Meter that measures in 2 ranges from 35 to 130dB with 1.5dB accuracy that meets ANSI and IEC Type 2 standards. It features fast/slow response time, A/C Weighting, Max Hold, and analog AC/DC output for connection to an analyzer or recorder. Comes complete with microphone wind screen, 9-Volt battery, and carrying case. The EA80 checks for Carbon Dioxide concentrations using a maintenance-free dual wave NDIR (non-dispersive infrared) CO2 sensor with a range of 0 to 6,000 PPM. It can automatically data log up to 20,000 data sets or manually enter up to 99 sets for later recall. Additional features include: auto power off, data hold, max/min with time stamp and alarm. Comes complete with six AAA batteries, Windows 95/98/NT/2000/ME/XP compatible software and an RS-232 interface cable. Datalogging Heavy Duty Light Meter The HD450 is a Light Meter which measures from 0 to 40,000Fc and 0 to 400kLux with 0.01Fc/0.1Lux resolution. Meter features: 5% accuracy, Peak mode (10s), Relative mode, Min/Max, Data Hold, backlit LCD display with 40-segment bar graph, and a rugged double moulded housing. In addition, the datalogger function can automatically store up to 16,000 readings or manually store/recall up to 99 readings. Comes complete with light sensor with a 3ft (1m) cable and protective cover, software with USB cable, hard carrying case and 9V battery.